The locket is traditionally defined as "a small ornamental case, typically made of gold or silver, worn round a person's neck on a chain and used to hold things of sentimental value, such as a photograph”. Objects that could be held within a locket include miniature portraits, a lock of hair, or even a tiny love letter. The appeal of the locket is that it allows the wearer to keep a loved one close to their hearts at all times. 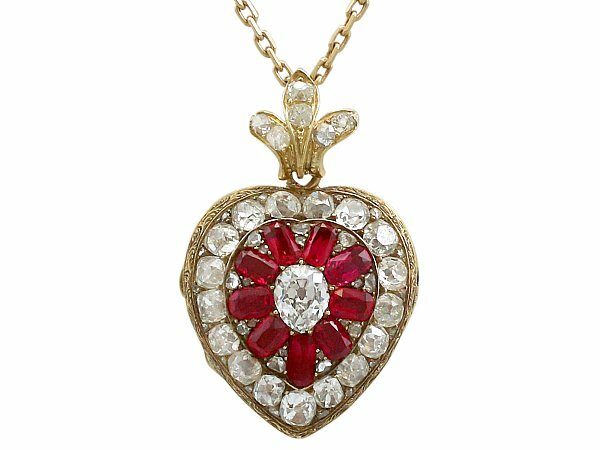 Lockets have been crafted from various materials over the years- including gold, silver, silver plate and even wood- and also in many different styles ranging from a simple oval shape to highly decorative heart shaped lockets, such as this stunning synthetic ruby and diamond encrusted locket we have here at AC Silver. The tradition of wearing a locket has spanned thousands of years and can be traced back as far back as the 16th Century, during which time they were worn by both men and women. Lockets containing a portrait of the of-the-time monarch were frequently worn by those with particularly patriotic tendencies. In general, lockets come attached to chains and are worn as pendants. Throughout history however, they have been styled in various ways, including ‘charm lockets’ attached to bracelets, or even in the form of a ring. One such ring locket was commissioned by Queen Elizabeth I (1533-1603) in 1575. This locket held two miniature portraits- one of her mother, the late Queen Anne Boleyn (1501-1536) and one of herself, and was made from a band of gold and mother of pearl which was then set with diamonds and rubies. It featured the letter ‘E’ set with six diamonds, placed over an ‘R’ made out of blue enamel. It is said that the Queen wore this locket up until her death. Displaying a certain level of class and wealth, the locket became a highly desirable item of jewellery. During the Elizabethan era the most highly acclaimed artists were hired to paint miniature portraits, resulting in truly unique, and consequently expensive, pieces of jewellery. It wasn’t only the price of lockets that gave them their high status; it was a tradition of Elizabeth I’s to gift a locket containing a portrait of herself into her favourites within her court. One famous example is ‘The Penicuik Locket’, which is thought to have belonged to Mary, Queen of Scots. 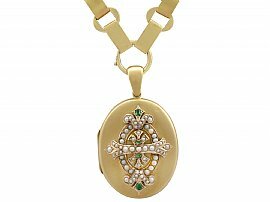 This locket was crafted in enamel and featured 14 oval filigree beads which originally contained small deposits of perfume. The locket featured two portraits: one of Mary and one of her son James. It is believed that the same locket was given to Giles Mowbray, a loyal servant of Mary, on the eve of her execution in 1587. By the 17th Century, lockets had accumulated even more sentimental value as they began to be used to pay respects to loved ones who had passed away. Mourning jewellery became very popular around the time of the execution of Charles I in 1649. His loyal subjects took to wearing miniature portraits of him set into rings and lockets. These portraits had to be worn in secret to avoid persecution; therefore lockets which closed and concealed their interior were ideal. It also grew more popular, during the 17th Century, to conceal a lock of hair within a locket. During this era a progression was made from featuring a miniature portrait to instead just focus on a miniature picture of an eye. Items of jewellery featuring these were commonly known as ‘Lover’s Eye Lockets’. In the late 1700s these eye miniatures were normally created in watercolour, painted onto ivory. They usually depicted the eye of a child, a loved one, a spouse or a mistress. These miniatures were popularised by the scandalous love affair between the Prince of Wales, who was later crowned King George IV, and a widowed catholic called Maria Fitzherbert. The King wanted to send Maria a token of his love; however such a love was heavily frowned upon in the royal court, so he decided to hire a miniaturist to paint only his eye in order to preserve his anonymity. The pair married in 1785, despite great disapproval from the court and no consent form George III (making their marriage illegitimate). Later, in 1785, the couple both had eye miniatures commissioned as an intimate symbol of their affection for one another. This famous example popularised the ‘Lover’s Eyes’ which emerged in affluent society between 1790 and 1820. Lockets reached their peak of popularity during the Victorian era. This was perhaps largely due to the fact that Prince Albert gave his beloved Queen Victoria the gift of a bracelet that had eight lockets attached to it- each containing a lock of hair from one of their eight children. After Albert’s death, Queen Victoria took to wearing a large mourning locket which contained a photograph of him on one side and a lock of his hair on the other. During this period of mourning, the nation was required to wear dull, simple mourning clothing. Lockets therefore became the optimal way of adding colour and decoration to an otherwise mundane mandatory attire. Lockets during this era ranged from quite simple designs to styles adorned with shimmering gemstones. During the First World War it became common practice for soldiers to give their loved ones lockets containing their picture- to serve as a reminder of them during their long stretches away from home. Because of the growing demand for lockets at this time however, the overall quality declined. In contemporary times, lockets are still utilised with their original function- to hold pictures of loved ones- and can be a gorgeous gift for many occasions such as weddings, new babies or even a milestone birthday such as a 21st or a 50th.